Worksheet E is used when prioritized dispatching points to a single feed cable with low cable pressure. It provides a logical, procedural approach to identifying the cause of the high flowing cable. It also serves as a record keeping device for future review, questions, or similar problems at the same location. Side one of Worksheet E provides a location-by-location representation of the cable route from the point where a cable becomes a single feed lateral. The beginning of the lateral cable is represented by Location F. Twelve additional boxes are provided to record information at each associated location. 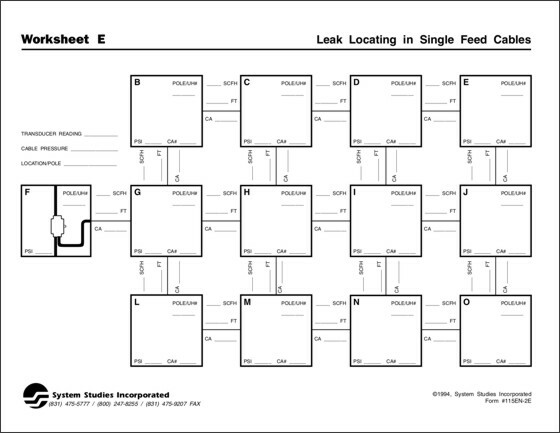 Side two of Worksheet E consists of the specific procedures for locating a leak in a single feed system. It also provides space to record the task number, cable ticket information, and cause of the problem. Like the other worksheets, side two also lists the equipment and formulas required to perform the leak locating procedures. Note: Worksheet E should be used in conjunction with Worksheet C when leak locating in offices with single feed systems.